Replica and Synthetic Replacments - Period by Design. In addition to our upgrading service, we can also manufacture and install new replica sash windows. These sash windows are gas filled, double glazed, Accoya™ hardwood units that match your existing windows. They will fit into your original box frames or if the frames have been removed, we can also replace them. Whether it’s out of choice or a requirement of building regulations, Sliding Sash Solutions can manufacture new replacement sash windows. These units are double glazed, replica sash windows that are traditional in style to match original section sizes, glazing bars, and period mouldings. We manufactured them in the traditional way with pulley wheels, cords, and weights. 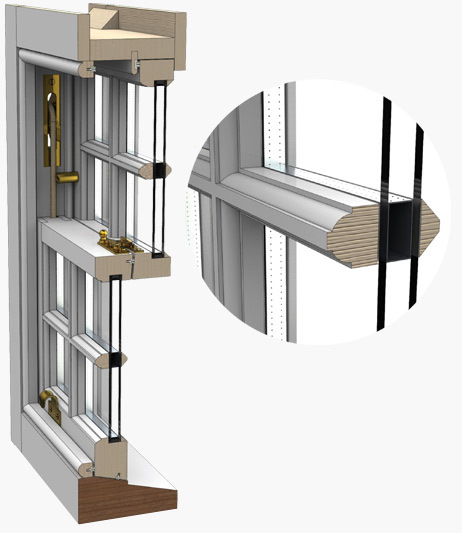 At Sliding Sash Solutions we understand the importance of replicating, as much as possible the original design. This is why we have perfected our design and manufacturing processes to produce finished results which are rivaled by no other. In addition, all our new windows are hand painted giving them the depth, texture, and appearance of original period windows.